Apple’s iPhone X event – Thumbs Up! Dashlane password wallet – Thumbs Up! My wife had a business trip to Las Vegas and I tagged along for a free vacation. We left on Friday, May 20 and returned today, May 30. The kids stayed at home with the grandparents. As always, we had a great time as we both love Las Vegas. We managed to make a few $’s gambling and get some comps (free meals). 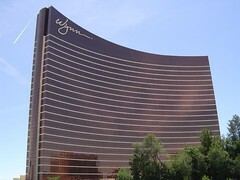 We stayed at the Wynn which is the newest hotel in Vegas. It’s an absolutely beautiful hotel and the best hotel we’ve stayed in while Vegas (this was our 7th trip to Vegas in 8 years and we stay in a different hotel each year). We had some good meals while in Vegas including steak at Capital Grill and Italian food at Maggiano’s. Both are directly across the street from the Wynn. We also received four free buffets of our choice (breakfast, lunch, dinner) at the Wynn for our video blackjack gambling efforts. Of course, we also visited Casino Royale for the cheap table games including $2 craps and came out a couple hundred bucks ahead. Click the picture of the Wynn hotel above for a photo album of our trip. Amazon Fire TV Cube Review – Thumbs Up!